The Zenreach mobile app was created to provide our on-the-go merchants with access to the features that help them efficiently and effectively connect with their customers online or in the store. Historically, the Zenreach product was a desktop app which served as a great platform to support rapid iteration and feature validation but was soon becoming antiquated. Especially for our on-the-go merchants and users who spend more time on the floor running their business instead of behind a computer screen. The product and design teams initially noticed this signal after a series of customer interviews in addition to reviewing data on a few of our drip and nurture campaigns. Realizing that close to 85% of users interacting with our campaign emails were opening them on their mobile devices. When design and product initially had the idea to pursue an app, one of the most significant obstacles was implementation. The engineering team was initially skeptical due to their lack of knowledge in native languages such as Swift. 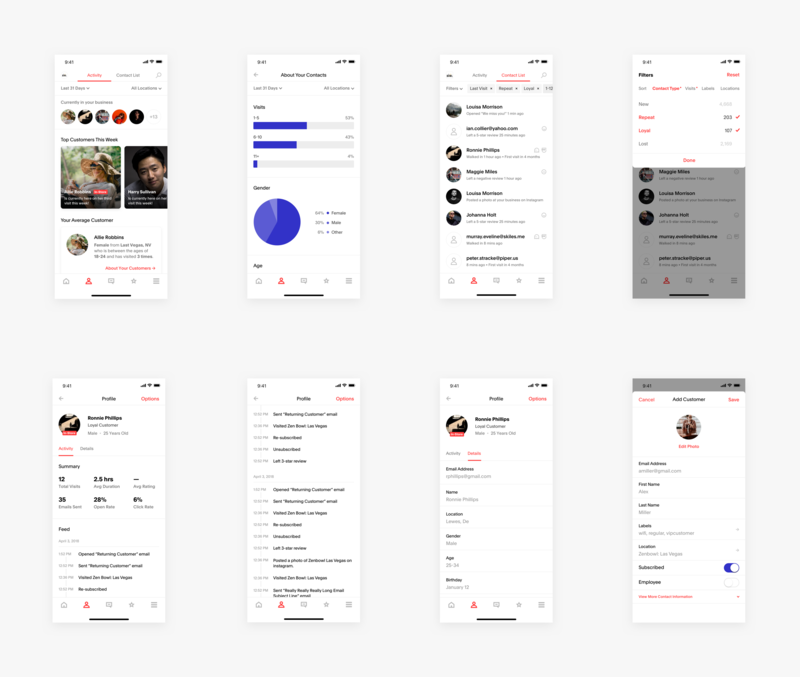 However, after sharing the data and research throughout the EPD (Engineering, Product, & Design) organizations, an engineering team decided to build a basic Zenreach mobile app with React Native during a hackathon. The hackathon success demonstrated to the engineering team that the implementation price tag was not as hefty as they had anticipated. In light of the hackathon success, the design team decided to reach out to a few more customers to gather additional insight into what their ideal Zenreach mobile app would be. Most users claimed that creating a mobile-optimized experience of our current feature set would be sufficient, but others wanted real-time notifications when a customer performed a specific action. Ranging from a loyal customer stopping by on their 10th visit, or that a social influencer just posted a photo of their business on Instagram. These were the types of online-to-offline features that were missing from our current product. Which, according to the users we spoke with, would be hard to accomplish via email or even by text. They viewed push notifications associated with an app much differently than other forms of being notified. After doing a quick survey, we found that SMS and text were primarily viewed as a channel for personal communications, while they viewed email with less urgency. With some preliminary testing involving card sorts and surveys, the design team was able to determine a general information architecture, feature priority, and where each feature belonged. We frequently checked in with a series of merchants and performed some light testing on UserTesting to ensure that we were continuously validating our design and product decisions. Because this was one of our first digital products to encompass the new Zenreach Branding, I provided the initial interaction and visual direction along with overseeing the entire execution by my design team over the course of 4 months. 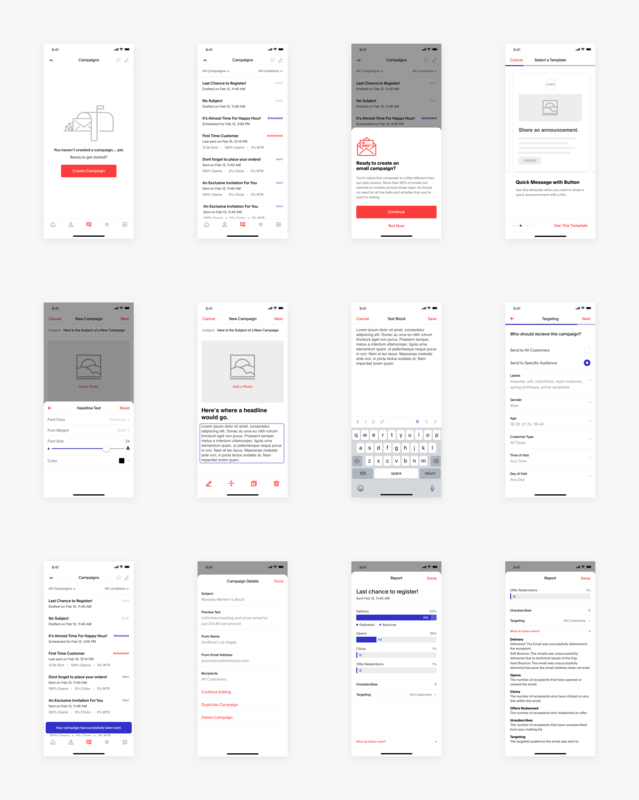 Above: information architecture of the app. One of the most significant features and pages of the app the design and product teams focused on was the home tab. The idea was to cater the most critical information to the user as soon as they open the app. 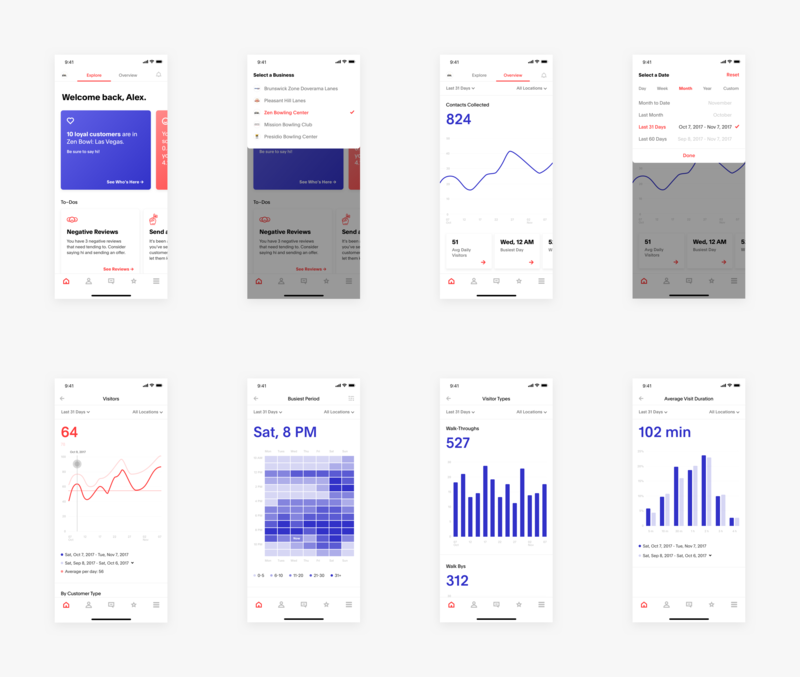 We initially imagined both time-sensitive notifications and chartable data sharing would share the same real-estate, but after testing initial assumptions, we soon found that we were missing a lot of details that we hadn't anticipated. Users wanted additional notification and marketing recommendations in addition to more data insights into their business' performance. The feedback ultimately forced us to separate the features into two respective tabs. The explore tab was for those who would prefer to have Zenreach analyze their data to surface recommendations as well as timely notifications. And the Overview tab dedicated to customers that preferred to analyze the data themselves, whether that is casually scanning the high-level summaries or diving a few clicks deeper for more information. Especially if they'd prefer to compare and analyze the reporting with previous time periods. Runner-up as the second most requested feature was the customers and contacts tab. Because Zenreach's product primarily revolves around the merchant's patrons interacting with their WiFi, our user wanted more tooling to understand their customer base better. Our desktop app's primary features consist of a recent activity feed and filterable contact list features, which provides little insight into who our merchant's customers were. 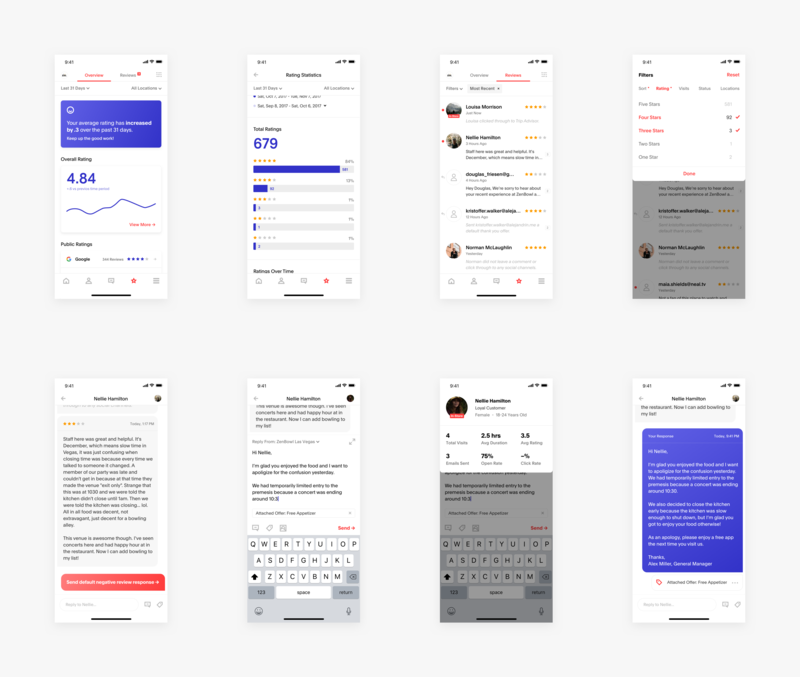 With that feedback in mind, the design team remained extremely cognizant that most of our users would primarily be using this on the go, so we wanted to cater an experience that helped merchants better understand their customers in real time. Especially if we could help facilitate in-person interactions by notifying the merchant of who is in their store at any moment, their top customers of a particular time, and, of course, a recent activity feed. We also applied the knowledge gained from dividing the home tab features into two pages. One page containing the more time-sensitive information and recommendations while using the other tab for more detailed views and in this case, a list of their contacts and customers. Other essential features and functionalities included demographic information, adding and editing contacts, and general details about their contacts. Above: key customers and contacts screens. The design and product teams hadn't planned on including a campaign creation feature initially, but our users were loud and clear that this would be a key driver for app engagement. Claiming that notifications and insightful information are helpful, but would be useless unless they can exercise that knowledge while on the go. Once the design team had created the optimal experience, EPD decided to break it into three phases and releases. The first containing a simplified experience of predefined templates without the ability to move and add/remove components within an email. Followed up with the second release of detailed email reporting in addition to a few more pre-defined templates. Then a final and continuous release of working in more WYSIWYG composing features including arranging, adding/removing, rich-text editing, and limited photo editing/manipulation. Just to note, as a team, one of the most significant design decisions we made was to proceed with limiting the ability to create multi-column emails. As found in our testing in addition to general research, the majority of people who interact with emails, do so on their mobile phones. So we deemed that multi-column creation is unnecessary. Some users were opposed to this limitation at first thought, but eventually admitted they wouldn't mind finding workarounds for the sake of an optimized experience for their customers. A few years ago HBS did a study on the effect of online reputation and how it impacts business. Their main findings included that a one-star increase in a Yelp rating leads to a 5-9 percent increase in revenue. Realistically, this could make or break a local or small business. With that precedent, reputation management is one of Zenreach's most influential and compelling marketing tools offered to merchants. In summary, the product enables merchants to prompt customers for a review of a most recent visit via email. The email serves as a screen that points promoters (those rating the business 4-5 stars) to popular review sites while intercepting detractors and encouraging them to submit a comment directly to the business. The merchant then has the opportunity to have a one-on-one conversation with that patron to address doubts and concerns the customer might've had at their establishment. 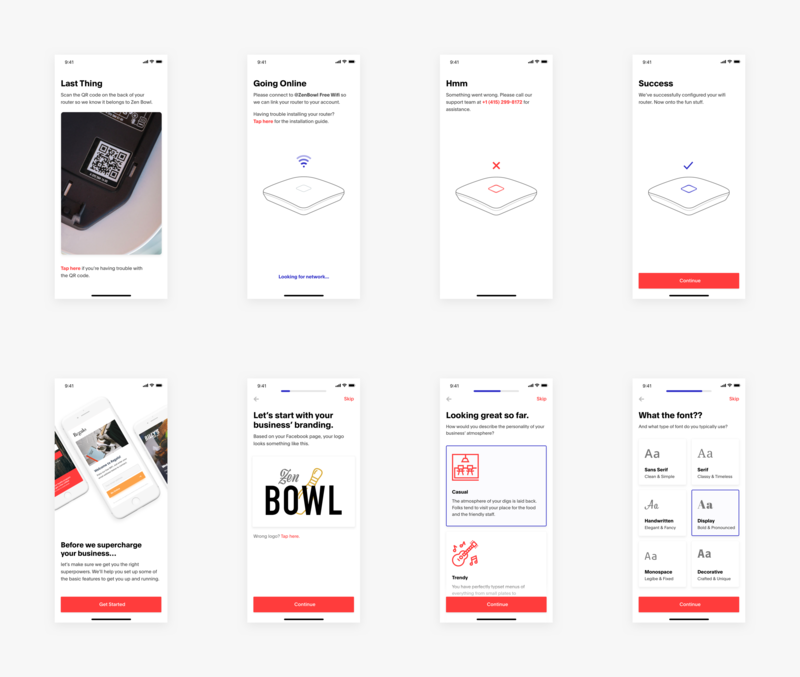 The design team wanted to create an intuitive experience that could help merchants easily monitor and respond to their customers within a couple of taps. The overview and reporting portions allow the merchant to analyze their business' reputation health by providing detailed insights into their average rating and many other data points. Furthermore, the merchants also can monitor the average ratings across the social networks of their choice, enabling them to consolidate their reputation management efforts to one place. The review tab is an aggregated list of reviews submitted through the email funnel. Initially, we resorted to utilizing the native mail app for review responses but received feedback from our merchants that it was hard to keep track of the conversation. In light of this, the design team decided to create a chat-like feature that not only helps the merchant keep a record of previous reviews and responses, but gives the affordance of a natural conversation. Above: key reputation management screens. Overall, we're starting to see an uptick in engagement as we continue to evolve the experience with each release. Our merchants are always providing actionable feedback that continuously gives us insight on how we can create an experience that benefits the everyday lives of our users. Onboarding is our next focus, which includes router installation, streamlining branding customizations, and informative feature walk-throughs. Overall, we're starting to see an uptick in engagement as we continue to evolve the experience with each release. Our merchants are always providing actionable feedback that continuously give us insight on how we can create an experience that benefits the every day lives of our users. For the next phase of this project, we're focused on the onboarding experience. This includes router installation, streamlining branding customizations, and informative feature walk-throughs. Above: preliminary exploration for the onboarding prototype.